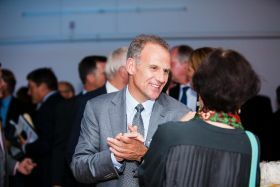 Tesco chief executive has been named as chair of a new high-profile global campaign to reduce food waste. The movement, named Champions 12.3, was unveiled at the World Economic Forum in Davos last week and aims to “mobilise global action” to halve per capita food waste. Alongside Lewis, it has been signed by 30 chief executives, government ministers and other leaders, including USDA secretary Tom Vilsack, Nestle chief executive Paul Bulcke, Unliver chief executive Paul Polman and president of The Rockefeller Foundation, Judith Rodin. Countries that have signed up include Vietnam, the Netherlands, South Africa and Denmark. The list of ‘champions’ will inspire action by leading by example on how to reduce food loss and waste, motivating others, advocating for more innovation to reduce food waste, and communicating the importance of waste reduction. Eva Kjer Hansen, minister of environment and food, Denmark, said: “Food loss and waste is a huge challenge for global food security, human livelihoods and the conservation of the environment that calls for global responses and individual action. And Denmark is ready to take its share and to engage in a new solution based global partnership. While Andrew Steer of the World Resources Institute said the champions “have the power to convert momentum into a global movement”. The announcement was made alongside the launch of The Rockefeller Foundation’s new seven-year YieldWise initiative, which aims to cut post-harvest losses in fruits, vegetables, and other staple crops in African countries such as: Kenya, Nigeria, and Tanzania.